MLP is starting to feel like a real distant hobby. Not because I hold any ill will towards the series or the fandom like I did in the break between Season 2 and 3, but just because it’s hard to maintain your passion through such a long break between seasons, even with a surprisingly strong movie in between. I figured that I should go back and give Season 4 another watch in preparation for Season 5, especially considering it’s the only season that I can’t boast having seen every episode at least three times. It’s not long now until Season 5 graces our screens and I get another opportunity to sit behind my computer screen late at night (god dammit timezones) with a bunch of cheap sugary crap to watch whatever crummy live-stream my dreadful internet will support, as has become the tradition for me with these two-parters. It always gets me giddy to watch these and to see the series be really ambitious, even if it falls just short almost every time because of a lack of breathing room in its conflicts. ‘Princess Twilight Sparkle’ is most certainly one of those two-parters, but thankfully it’s one of the better ones in that regard given it’s a somewhat subdued conflict that doesn’t get ahead of itself as often as it could. As the title may suggest, the core conflict within this episode is Twilight’s role as a Princess and how she adapts to her responsibilities. In terms of this conflict and the way Twilight is characterised this episode is pretty solid in how it fleshes out Twilight’s duties within the role of Princess, which is established very well in the opening scene depicting Twilight struggling to get her Alicorn wings under control. 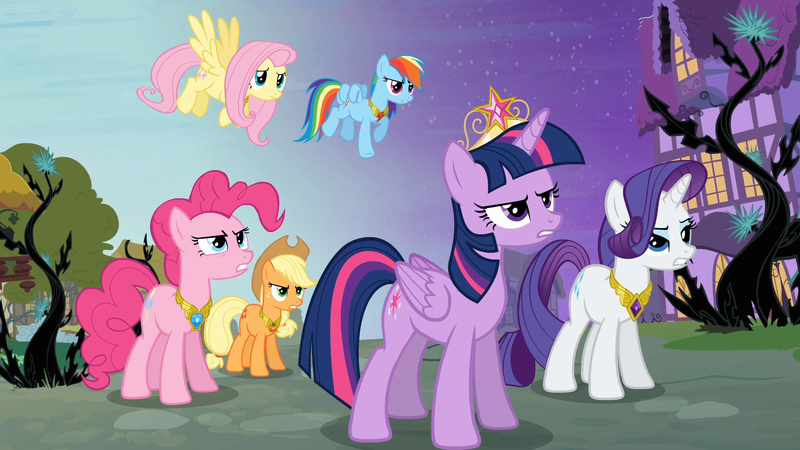 It also leads to some wonderfully quirky scenes like Twilight’s panic attack having her flapping her wings until she hits her head on the ceiling above her, a great little gag that the show couldn’t do in the past, but it also leads to some earnestly strong character moments like her conversation with the guards where she’s forced into giving immediate orders to them under phenomenal pressure. The conflict itself comes right before the Summer Sun Festival, which brings us to exactly a year after the story began and sets the scene for Twilight’s conflict as a Princess to be woven together with the friendships she’s made. This is a strong move, but unfortunately not quite as gracefully put together as one would hope. The conflict with Twilight being sent out of the Everfree Forest because her friends are concerned with her survival given she’s the only Princess that Equestria has at the time isn’t so much a “logic” problem that betrays the tightly-knit friendship the Mane 6 have like I’ve seen it described to be. To act irrationally like they did out of caution is reasonable under pressure, and it helps to synthesise the conflicts of responsibility and friendship. However, the reason why it doesn’t quite come together in a neat bow is that the conflict itself is tragically brief and to-the-point, which doesn’t do much in terms of engaging you with it. Among others, the first scene after the credits is another scene that doesn’t have the best tact with exposition, discomforting given it’s introducing the important details. MLP’s two-parters have a real tough time with giving some space to their ideas, and you get a fair few scenes like the aforementioned that feel straight-up clustered. Like I said, though, it’s not the most guilty two-parter when it comes to exposition dump. I would be willing to say this is at least 50 percent good subtle exposition and 50 percent awkward stilted exposition, because there were some really nice scenes where narrative details unfolded. One of my favourite parts is Twilight’s flashbacks carefully revealing the ambiguous details that lead to the Tree of Harmony. It’s a real great way to get people invested and to get people questioning. When the two-parter ended with the appearance of a mysterious box and the subsequent promise of a season long story arc it undeniably raised further interesting questions that really drew people in, regardless of whether or not you believe that the story arc was as satisfying as it could have been in the long-run. That’s certainly not it, though. Suffice to say ‘Princess Twilight Sparkle’ has plenty more merits to boast. The animation is as glowingly gorgeous as MLP: FiM gets, and there’s plenty of sights to behold from the infested Ponyville and Everfree Forest to the battle between Celestia and Nightmare Moon to the glowing rainbow trail when the Elements get returned to the Tree of Harmony. The comedy is darn tight in here too, the black vines infesting Ponyville being a set-up for many a brilliant seemingly spontaneous visual gag and with Discord being wildly fun as always. This episode is a treat for people who love the sharp sense of humour MLP has at its best. ‘Princess Twilight Sparkle’ is, all in all, a fairly uneven episode, but it’s a damn fine establishing arc within the broader arc of Season 4 with plenty of really compelling content. Season 4 was a bit of a divisive one, and in all honesty I don’t think it did a great job carrying the momentum of the arc in a lot of places, but it’s an arc filled with some really special ambitious moments like the ones in this particular episode. Some not so great ambitious moments, but some really brilliant ambitious moments of visual ecstasy, fantastic Ingram compositions, comedy gold and really glowing character work, all of which have some of the highest peaks the series has ever had. Season 4 is a wild ride, and I’ve strapped myself in once again.